The Kirkpatrick Fam: So long Shreveport! It has been three weeks since we came to Louisiana and so far we have spent the whole time in Shreveport. We are finally figuring out the city and can find our way almost anywhere . . . at least the important places like Walmart and Quiznoes. But this week we are moving east and will be staying in the towns of Ruston and Monroe Louisiana. 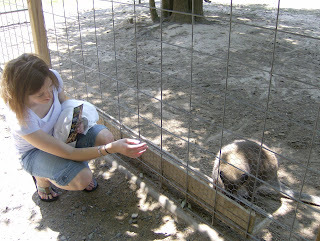 I thought I should post some pictures of things we have done since we have been here in Shreveport. 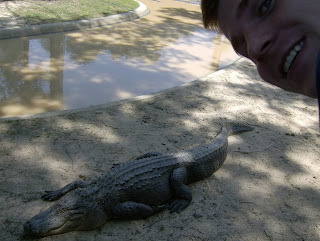 Our fist adventure was to an alligator zoo. 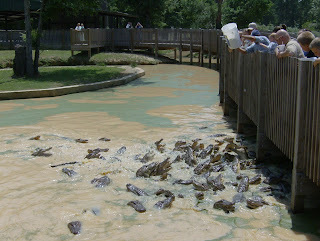 They had tons and tons of alligators that you could get really close to. They were kind of boring and just sat in the sun hardly moving. When the guy came to feed them it was really cool because they were jumping out of the water and climbing on top of each other just to get some food. There were also some other animals at the zoo that we saw. 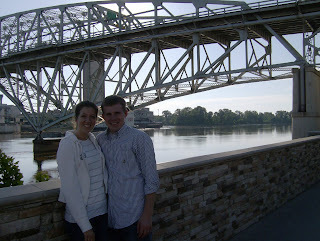 Our favorite place here in Shreveport has been the Louisiana boardwalk. There is a huge river that runs right through the middle of downtown. On one side of the river is this really neat outside mall with tons of outlet stores (like Gap!) and restaurants and a movie theater. It was really pretty and just fun to walk around. We saw the movies Chronicles of Narnia two and the new Indiana Jones. I also got four sweaters at Gap for 25 dollars! This past weekend we went to the "Mudbug Madness festival." It was just a bunch of people who get together and boil crawfish and drink. We only stayed for like 30 minutes because not only did the crawfish look disgusting, but it was soooo hot and humid out, we were all dripping sweat. We had today off for Memorial Day, so we decided to go to this interactive science museum. It was actually pretty entertaining. 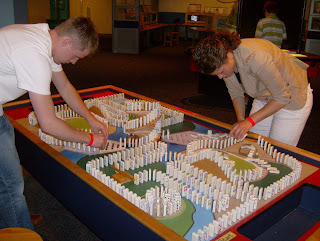 Dan loved it and his favorite part was building this huge domino track. Besides all that we have been getting the hang of our job, watching TV, and swimming in the pool. It has been a lot of fun and it seems like we have just been on vacation since school got out. I was really sad to miss Quincy's wedding and I wish I could have seen everyone that was there! It does look like you are having fun. The alligators would have been cool to see. Good luck in you other towns! Fun, I seriously am so jealous of your guys job! But, I did get to go to Quicny's wedding so I guess it all equals out :) Hope you get settled soon in your new cities and find the Walmart and Quiznos' there asap! We loved (Molly and I) seeing photos of Shreveport. What river are you standing in front of? I'm glad you enjoyed the museum. Dad said it was 94 in San Antonio and so humid. We were chilly today but waiting for 70 degrees tomorrow. Keep posting! Kelly told me you started a blog, so I googled it and here you are! It's fun to read about what you're up to in Louisiana! I have to say you missed out on the crawfish, though, they're delicious! We love you guys! Fun! I love getting your updates! I love the pic of Dan's awesome dominos...what a stud! hehe! I wish I could see that river in the middle of downtown, that sounds amazing...I miss you so much!